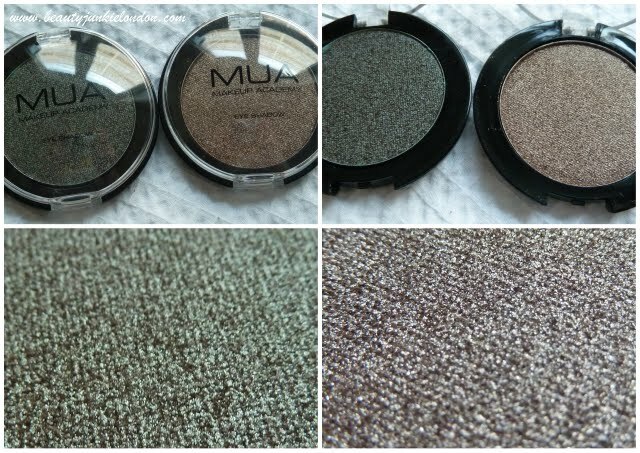 I was having a little play with the eyeshadows on the MUA (make up academy) stand in Superdrug recently and decided to purchase a couple that really impressed me. In fact, most of the shadows actually impressed me – the texture is so smooth they almost felt like a mousse rather than pressed powder and the pigmentation and payoff are really impressive for £1 each. The two shades I picked up are shade 11 and 12 (both ‘pearl’ finish). Shade 12 is a mostly green/brown shade that when swatched has a hint of purple and 11 is a shimmering warm brown that has a frosty finish when swatched. I haven’t used these to create a look yet, so will do an eye/face of the day when I do. How would you use these colours to create a look – what would you blend them with? These MUA eyeshadows cost £1 each from Superdrug. I love MUA shadows! They are amazing, and for £1 that’s even better 🙂 Does the top shade look a lot like Club from MAC or is it just me? Wow, they do look good! I also have the same brown which is great as an everyday shade. And the dark purple which i don’t know if i’ll ever be brave enough to use but the colour is beautiful! The Mac/Too Faced dupe looks cool. And the other one is very pretty too.